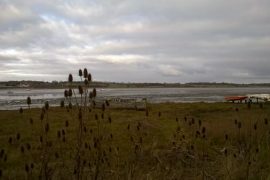 One of the tricks of getting the most out of what Essex has to offer, is to keep a close eye on the weather forecasts. They’re pretty accurate these days, and the forecast for yesterday morning was for grey and wet weather heading in from the Atlantic to the west soaking most of the country from early on, but with eastern England remaining clear and sunny, although cold, until mid-afternoon. This was quite fortunate for two Russian ladies who had got in touch earlier in the week, asking for a tour of Colchester. (More about our tours here.) They were coming from London for the day, and wanted to start their day out in Colchester with a guided tour. I met them at Colchester Town railway station at 9am and they had the best of the weather in the morning, as I spent two hours with them showing just a little of what Colchester has to offer. 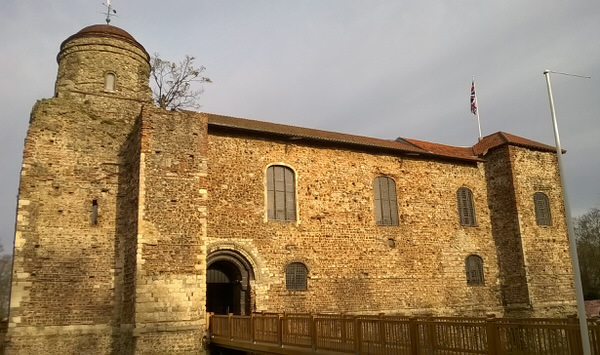 As with many visitors, Colchester Castle Park is the highlight of the tour – they love not only the castle and the Roman wall, but the park itself. Having broken the tour with a coffee and chatted to the two charming, globe trotting young ladies, I decided to take the opportunity the blue skies offered to take some photographs (see below). 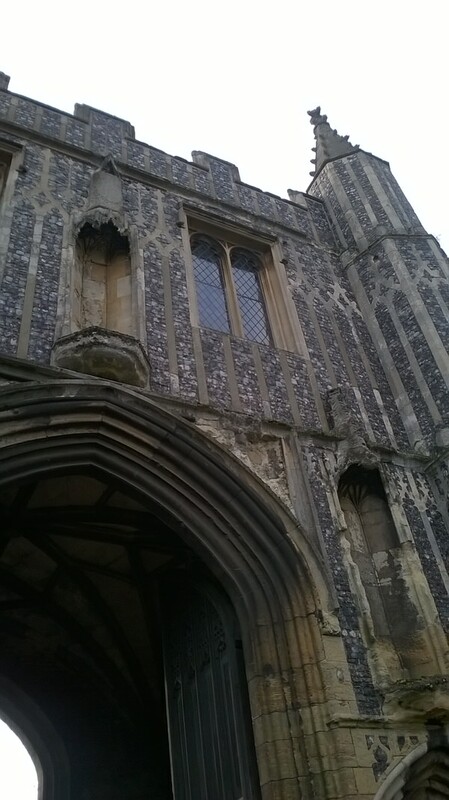 St. John’s Abbey Gatehouse is just 5 minutes walk from Eld Lane, but not many people know about it. It is just one part of Colchester’s fascinating history, tying in with the Peasant’s Revolt, and the later Reformation. One of the leaders of the revolt, Wat Tyler, has been claimed as a son of Colchester (although other town’s claim his as well). The Gatehouse was built to protect the Abbey from the threat of the Peasant’s Revolt, but it couldn’t protect the Abbey from the Reformation, and whilst nearby there are substantial ruins of St Botolph’s Priory, there’s no trace of the Abbey for tourists to see! 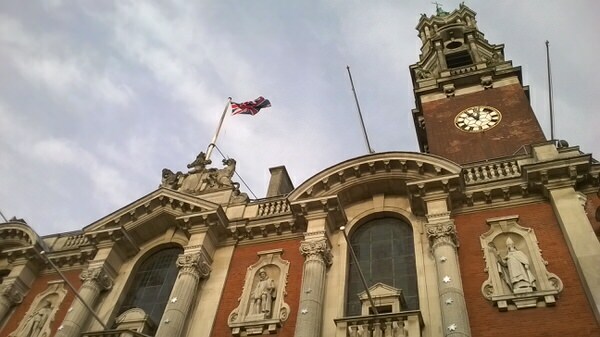 Colchester Town Hall is a relative baby in terms of age, compared to other buildings in town. It’s Edwardian, and Gothic, and sits on the site of earlier Town Halls – indeed, there was a Moot Hall there 800 years ago. The Town Hall was memorably brought to life as part of the ‘Light and Shades’ Halloween celebration in 2015. Colchester Castle is of course one of jewels in the Colchester crown. It’s the largest Norman Keep ever built, and is built on the site of an earlier Roman Temple. It is now home to Colchester Castle Museum, given a new lease of life with a multi-million pound revamp in 2014. But it’s also keeping up with the times, and part of the outside of the castle will appear in the forthcoming Hollywood film of the computer game ‘Assassin’s Creed’. It also sits in Castle Park, which as I mentioned earlier, is always admired by people visiting Colchester. And, new for this year, it’s hosting the Colchester Winter Wonderland and Ice Rink. In addition an the outdoor ice rink there are stalls, a Santa’s Grotto, and a lovely old carousel. And if that wasn’t enough, there was the lovely Georgian Hollytrees Museum to admire, and over the road there was a Craft Fayre in the Grade II listed building which hosts the Minories. And the Minories’ tea room, which I’ve been in many times over the years, is now run by Wilkin & Son, of the Tiptree jam fame. They’ve now got several tea rooms across Essex, and I’ve been into the ones in Dedham, at the Tiptree Jam Museum, and at Heybridge Basin. And out through the back gate of The Minories Garden, there is firstsite, which was hosting a Secret Vintage Fayre, which was thronged with visitors. It was a lovely morning in town, sharing the beauty that Colchester has to offer to some visitors, and then being able to appreciate what was on offer in just one tiny part of the town. 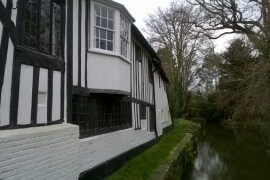 A little village by The Stour just over the border into Suffolk, a lovely pub, and a Constable painting!